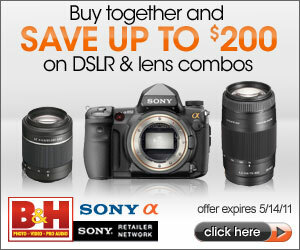 As one might have read, Sony is going to be announcing their A77 DSLR, which is the replacement for the A700 DSLR. A good deal of expectation is being heaped on this new camera and for me, some extra money will be spent in addition to the cost of the camera itself. I'm a consumate user of compact flash. I own and use PhotoFast 16GB and 32GB cards, both rated at 533X. They are great performers and are rock solid. Needless to say, I've spend a bit of money in getting them when 533X compact flash cards were fairly new. They work great in the A700 and I had hoped to continue to use them in the A77. However, Sony decided against including support for compact flash. Instead, it will be Memory Sticks and SD cards. The current top of the line Memory Sticks are the HG HX type cards, which are advertised as being "50MB/second" cards. However, that is only the READ speed. If you are writing to the card, the minimum WRITE speeds are 5MB/second and 15MB/second for 4bit and 8bit modes, respectively. That is fine for writing out 28mbps compressed video. However, it will cause the buffer to empty out slowly, causing wait times between bursts of shots. The RAW images on an A700 are 17MB in size. With the 533X CF cards, I can go 19 shots before the buffer tells me to hold off. With the MS, it drops to between 9-12 frames. Granted, you can shoot as soon as an image is flushed out, but you're going to be waiting 1-2 seconds between shots. Not ideal. Now, looking over at the SD memory card side of things, if you go with SDHC and SDXC cards, the rate maxes out at around 22-25MB/second in real-world performance. In fact, SanDisk non-UHS-I SDHC/SDXC cards are generally rated at around 25MB/second max. This isn't bad, and for the A700, would be acceptable. However, for a 24MP sensor dumping 36MB RAW files, this too will choke up the buffer if you have several fast paced sequences you're trying to capture. Enter UHS-I, which claims a bus capable of 104MB/second read and write. The top of the line UHS-I SDXC cards out there are claiming 95MB/second read and 80MB/second write. If it were fully leveraged, that would be perfect! In fact, there are users out there who have tested out their SDXC capable cameras, like the D7000 with the UHS-I cards, only to find that the performance difference between a SanDisk Extreme Pro (45MB/45MB) vs a Delkin (95MB/80MB) shows no performance difference. The reason, when the calculations are in, is that the D7000's implementation bottlenecks at 22MB-25MB/second. So there is no gain. If the A77 properly implements UHS-I, it will/should provide amazing shot-to-shot performance, with an image buffer that will effectively expand, with a fast enough card. This is what people saw with the firmware update and fast UDMA CF cards on the A700, an effective doubling of the image buffer from 8 to 18. If the A77 implements UHS-I properly for SDXC cards, I will be one happy camper. However, if it implements _just_ the SDHC/SDXC non-UHS-I interface, then we will see transfer speeds capped at around 22MB-25MB/second, with RAW image shooting suffering. The other bit of interest, from a gear upgrade perspective, are the batteries. It would appear that the A77 might continue to use the same cells employed by the A700, the NP-FM500H. This is likewise a boon to those of us who are already A700 shooters: we have a handful of these batteries, and it will mean we can re-use those batteries in the A77. That much less of an obstacle to upgrading. I've made my peace with Sony's decision to go with SD vs CF, so long as they implement UHS-I properly. At this point, I'm just waiting for the camera to come out, so that I can get it into my hands and see what it can do. I'm looking forward to the low light performance as well as the upgraded AF system. I'm also looking forward to the live view auto-focus, as it will greatly help with manual focusing on subjects. Oh, 24MP doesn't hurt either, for some nice blow-ups. The UHS-1 Cards will still be a help for memory buffer clearing, vs Class 10 cards. Just do not overspend on a ton of the Delkins until your Sony's aren't bus speed limited like my Nikon D7000's. Given that the RAW(s) are 24MB/second, it sounds like it is clearing images from the RAW image buffer at roughly that rate. However, I find myself wondering if that 25MB/second isn't the sustained transfer rate of the card, and whether a Delkin or one of the other Asia branded 95MB/second r/w cards will be able to manage a sustained transfer rate faster than 25MB/second? I'll most likely pick up a variety of cards to test against the camera when it ships in the US and I take ownership of one. Am hoping the 25MB/second is a card limitation rather than an in-camera bus limitation.